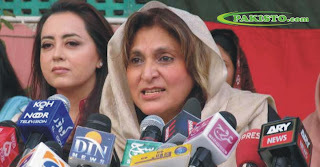 Home » Politics , PTI » Why Fauzia Kasuri resign from Pakistan Tehreek Insaf? Why Fauzia Kasuri resign from Pakistan Tehreek Insaf? ISLAMABAD: Fauzia Kasuri, a central leader of Imran Khan’s Pakistan Tehrik-i-Insaaf, announced Wednesday that she was quitting the party over claims of ‘unjust’ distribution of party tickets on reserved seats. Fauzia Kasuri, who was once PTI’s women wing president, claims to have been ignored by her party for its choices in reserved seats for women. Announcing her decision at a press conference in Islamabad on Wednesday, she alleged that the Tehrik-i-Insaf has been “held hostage by a mafia”. She, along with thousands of other party members, have become victims of that mafia’s injustices, she said. In earlier posts on social networking website Twitter, Kasuri said she was ignored by the party leadership who she said did not even respond to her reservations against what she claimed was a not-so-transparent distribution of party tickets to women on reserved seats. One of her main objections also included the awarding of party ticket to Dr Shirin Mazari who had quit the party six months back but had returned just ahead of the elections. Mazari was awarded the party ticket for reserved seats for women in the National Assembly. Over the past week, Kasuri had been making desperate calls to the party leadership, including to Imran Khan, but does not seem to have gotten a reply. Although party office-bearers claim they have not received a written complaint by Kasuri. “Party is sending signals for me to leave,” Kasuri said in a post on Twitter prompting an immediate reply from PTI leader Shafqat Mehmood, asking her to stay. The issue has taken centre stage on popular television talk shows for the past two days with anchors highlighting Kasuri’s case to question PTI’s internal politics. Meanwhile, party chief Imran Khan, who is yet to recover from the forklift fall, has reportedly rejected Kasuri’s call for a review of the policy of awarding tickets on reserved seats. Kasuri abandoned her US nationality to serve PTI which came out as the third largest party in the May 11 elections. But the party did not manage to take that many seats in the Punjab province, traditionally a stronghold of Nawaz Sharif and his PML-N. As many central leaders of PTI hail from Punjab, differences surfaced over reserved seats’ nominations which were very limited in number. PTI had to name only two female MNAs from Punjab and the party chose Mazari and Munazza Hassan, leaving Kasuri and few other women leaders out in the cold.